You know that one pair of pants that are so comfortable you wish you could wear them everywhere? These are those pants. I got them from Mango a few seasons ago and still find myself reaching for them every morning when I wake up. And every night when I slip off my heels to relax and spend a night in. The hardest part, however, is wearing them out in public without looking like a hobo. Not sure if I accomplished that here, but I tried to add some structure to their loose fit with a silk tank, leather jacket, and some stripe action by way of this equally comfortable sweater and scarf. The scarf is another winter favorite of mine, as it unfolds to be (almost) as big as a blanket and is super soft. Top the look off with my favorite tote (as Micol knows, I'm obsessed with all things French) and we're ready for a trip to the market. You definatly accoplished your goal oon not looking like a hobo i have to say i did not even notice that you wear wearing sweats until you mentioned it in the colum below but i also have to say that the black and white sweater worn under neath the leather jacket makes the whole look, look a bit hoboish but besides that its an awesome outfit. The scarf is great! LOVE the red color! You seriously look gorgeous in these photos. I also have a favorite pair of jeans that sadly are nearing their end so I'm on the hunt for new ones. Cute look! I was browsing through you guys posts are the photography and styling are beautiful! Thanks so much for leaving a comment on my blog. =) Definitely a fan of you guys! Maybe you could follow back? Have a lovely day! 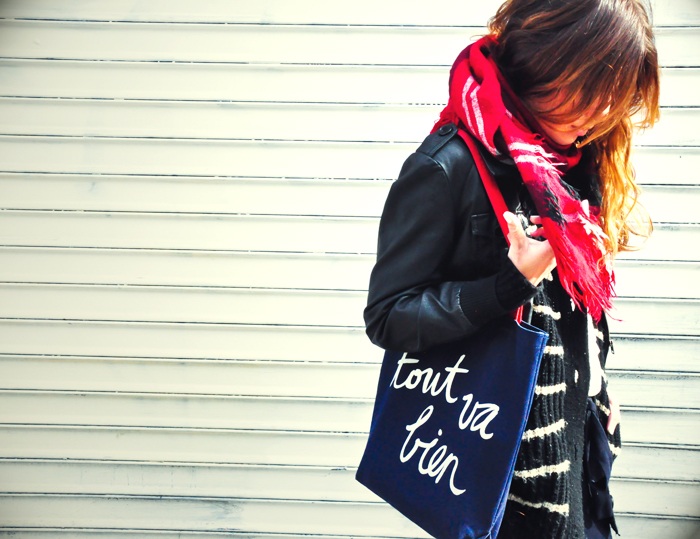 super cute bag & scarf! Love your style! following on bloglovin now! 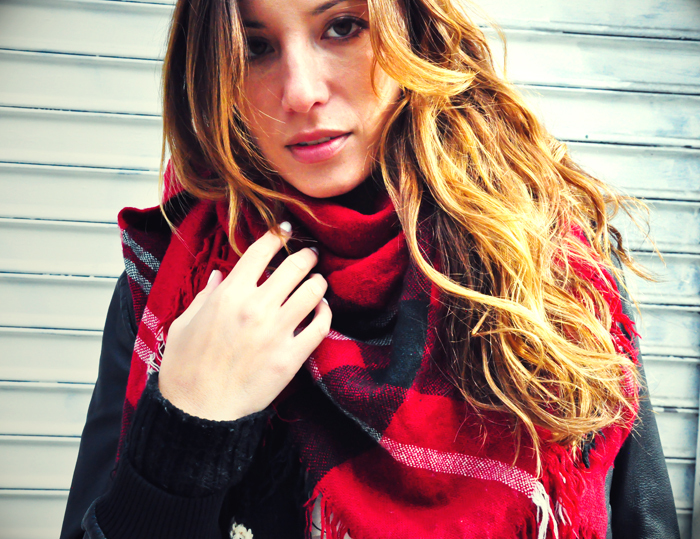 Love the scarf! It would be one of my favorites too! Need to get that tote, too cute! Love you hair and that bag is nice! "These are those pants" hahaha I wish I had those pants and when I mean "those pants" I mean yours! Haha Mango...what a great find! Love your tote! nice! i like the last photo. Great look, I like your bag a lot!